Jeffrey is coming for your Thanksgiving advantage, Jerry. Every year when the NFL schedule is released, the first thing Jeffrey Lurie said he does is look at whether or not the Philadelphia Eagles will have to play a Thursday road game on a short week of rest and preparation. Each year, 30 of the NFL's 32 teams have to worry about that. There are two — the Dallas Cowboys and Detroit Lions — who don't, as they are rewarded with a home Thursday game on Thanksgiving every single year. Meanwhile, the Eagles have had to play Thursday road games on short rest in each of the last two years, and four of the last five. It is also rumored that the Eagles will be forced to play on Thanksgiving in Minnesota this year, which would make it five of six. They'd seen enough of that crap, it would seem. Leading up to the 2019 NFL Owners Meetings in Phoenix, an interesting nugget popped up in the media guide. The Eagles proposed — and later withdrew — a resolution to negate the Cowboys' and Lions' competitive advantage. Withdrawn, By Philadelphia; to continue the annual tradition of having Dallas and Detroit play on Thanksgiving, provided that one of those clubs host a home game with the other club playing away, and alternating home and away games each subsequent season. According to studies done by the Eagles (and, you know, common sense), it's a major disadvantage to have to play on the road on a Thursday after you've just played a Sunday game. "We do a lot of data analysis of schedules and things like that, and short weeks, because you’re trying to prepare and recover and all those kinds of things, and one of the things that came up was the difficulty sometimes of short weeks on Thursdays," Lurie said. "Nobody wants to play away on Thursday night on a short week, and we feel it should be a balanced schedule in terms of teams that have to play on a short week, away. That’s all. It has nothing to do with Thanksgiving. It’s a great tradition in Detroit, Dallas, whatever, but just on a competitive basis, as soon as you look at the schedule, you want to know, are you on short week on a Thursday?" Even if Lurie was clear to note that the Eagles' proposal had nothing to do specifically with taking away a Thanksgiving tradition, his phrasing in saying (emphasis mine), "It’s a great tradition in Detroit, Dallas, whatever," is telling of what he thinks of those traditions. Ask any Cowboys or Lions fan, and they will tell you that Dallas and Detroit were the the most willing participants to play on Thanksgiving way back in the day. Lurie, like the vast majority of non-Cowboys and non-Lions fans, couldn't care less about that tradition. And really, the Eagles' proposal didn't seek to take it away. It only intended to modify it in a way that would allow the Cowboys and Lions to continue to play every year on Thanksgiving, but with every other year being a road game, which is an entirely reasonable solution to an obvious competitive advantage. So what was the feedback the Eagles received from the league that caused them to withdraw their proposal? "All we heard was that the competition committee said there wasn’t enough support," Lurie said. "It was meant really to start to analyze the impact of a way Thursday short week games, and should that be spread evenly. It was a manner of doing that. It wasn’t focused on the teams that are involved." Well, it kind of was. 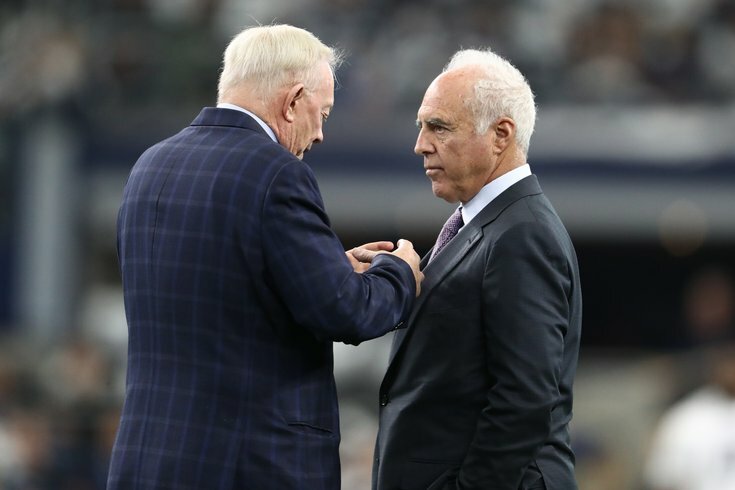 Asked directly if the Cowboys (for example) have an advantage over every team in the NFC East because they get a home Thursday game every year, Lurie answered, "Correct."